I just noticed that, following this entry, I only have 8 more posts to go before ABC reaches 100! I'll have to celebrate with a little victory dance...or a margarita. Oh! And I've got one more follower who just joined this week, which brings the number up to 21...so now we should definitely celebrate with a margarita! The 2011 Summer Blog Tour continues as author Misa Rush stops by to share her thoughts on writing and life. I just finished reading her novel Family Pieces and I have to say it was such a great read! Family dramas are a favorite of mine, and Family Pieces does not disappoint! Please take a minute to read what this fabulous author has to say about her own experiences and then check out my review! A Bundle of Contradictions is uber-proud to present....Family Pieces author Misa Rush! Hi! Thank you, Wendi, for allowing me to guest post. My life has been, is, and probably always will be busy. Like all moms, it is easy to fill every moment of the day juggling what needs to be done, what has to be done and what can be done to make a difference. I sometimes think it would be nice to slow down, but I’m not sure if I’m personally capable of that. I have a love/hate relationship with challenges. If one is presented to me, I simply have to do it to prove to myself that I can. Writing had always come easily to me and I had always said I wanted to write a book – someday… so, when my husband said, “Then why don’t you do it?” what was I to do? I’ve also always believed everything happens for a reason. Although some of my experiences came long before I started to write my novel, they certainly molded my character. Gymnastics, at an early age, taught me discipline and perseverance. Four hour practices, six days a week for eighteen years might not be for everyone. Yet, the life lessons it taught me was what kept me writing on days that life wasn’t so sweet. I started writing my novel when my daughter was two. From beginning to end, the book took almost two years to write. During those years, I endured twelve weeks of morning sickness only to learn my pregnancy miscarried at nine weeks. My next pregnancy went relatively smoothly, until my son stopped breathing after he was born. He was released after eight days in the NICU, but for months I wouldn’t sleep for fear that he’d stop breathing. During this time, working on my novel provided an escape from reality. Thanks, Misa, for all your insight and the lovely post! Karsen Woods seems to have the perfect life: a handsome boyfriend, a loving family, and a busy social life. The homemade puzzle necklace she wears, created by her grandfather, serves as a link to her family back home while she's away at college...but when her mother suddenly passes away, Karsen's charmed life turns into a nightmare as she struggles to understand the links that truly holds her family together. This story made me think about my own family, along with all the tragedy, joy, and drama we've experienced. As I have said before, this connection to the reader is of the utmost importance, and Misa Rush is a rare author who has the ability to both write well and hold my attention. It would seem like a common talent, with so many books being published every day, but I think we can all agree that not every writer can actually do both of these things and do them long enough to keep their reader captivated for the length of a novel. Misa Rush did that and more with Family Pieces. It wasn't just Karsen who interested me; in fact, Addison, with her complexity of spirit, kept me coming back for more. She was the character who threw a wrench in the works, and I'm always drawn to the types of people (whether real or imaginary) who are not necessarily the most like-able at first. 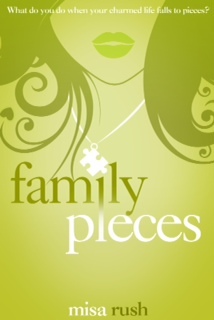 I highly recommend Family Pieces for your summer reading list! To learn more about Misa Rush, click here to visit her site and pick up a copy of Family Pieces for your own collection. Thanks again, Misa, for sharing your thoughts with us! I look forward to more of your work. I think a margarita is definitely in order :) And so glad you liked the book! I ditto the margarita! Thanks for the great review! Of course! I was so glad to do it!